When you begin a mesothelioma chemotherapy regimen, you’ll find yourself spending much of your time at your infusion center. Since these sessions typically last three to four hours, most infusion centers provide private to semi-private areas for treatment with Wi-Fi for mobile devices and perhaps a television to pass the time. If your white or red blood cell count is too low when you arrive, you may be spending closer to six hours in treatment. Once chemotherapy is administered, you won’t be able to leave the facility. If you’re not prepared, boredom can set in quickly. You can also get cold or hungry during treatment. That’s why it’s important to pack a well-stocked chemo bag of essentials and keep it close at hand even before arriving at the infusion center. It helps time fly by faster, and makes the experience more comfortable and personal. As with any medical appointment, it’s important to pack your personal identification, emergency contacts, insurance cards and other medical documents, including written doctor’s orders. The advanced preparation not only makes check-in smoother, but helps patients feel more in control of an often-worrisome process. During chemotherapy, many mesothelioma patients experience anticipatory nausea. When they associate the center itself with the negative side effects they feel during treatment, they may feel nauseated before they arrive for treatment. In case of such an event, keep an airsickness bag within easy reach on the ride to the hospital. Don’t forget hydration options, such as water and green tea and a portable cooler for safe storage. Cancer survivors find chemotherapy to be one the most challenging aspects of mesothelioma treatment. Although it can be a life-saving therapy, it can also be a painful and exhausting one; side effects such as fatigue and digestive distress are quite common. However, keeping photos of your loved ones at hand can help you remember why the fight is worth it. Cancer centers often keep their chemotherapy rooms on the chilly side; a blanket, shawl or sweater can keep your temperature stable. Added bonus: Knit or crochet your own for entertainment during your appointment. You can knit a standard-size scarf in just three or four hours with thick wool and large needles. When you’re presented with several hours of down time, you might as well use it for the hobbies you could never squeeze into your schedule in the past. Reading is a top choice for many patients, and some chemotherapy centers stock miniature libraries of popular titles. Of course, packing your own books guarantees you’ll have something that fits your preference. Need a few recommendations? Our suggested reading list can start you off with several choices, from entertaining novels and inspirational stories to educational mesothelioma materials. The American Cancer Society (ACS) suggests that music therapy can help reduce chemotherapy-induced nausea and vomiting. It may also have positive effects against pain, sleeplessness and depression. The ACS does note, however, that a therapy song list is not always effective when compiled by the patient. Consider reaching out to a musical interventionist if you feel that calming instrumentals, uplifting lyrics and soothing rhythms may make chemotherapy a less stressful experience. Creative arts, from drawing and coloring to painting and sculpting, are popular among cancer patients for their surprising therapeutic benefits. Even if you don’t have an artistic background, consider packing some sketchbooks, pastels, or collage materials to channel your nervous energy into during your appointment. Aromatherapy oils can also reduce chemotherapy-induced side effects, such as nausea, fatigue and anxiety. These natural essences can provide relief in just a few moments  and they’re completely non-pharmaceutical. Simply dab a few drops on your wrist or stomach, breathe deeply and let them sink into your skin. Because they’re not ingested, they’re ideal remedies for days that you can’t stomach the thought of swallowing a bitter medication. Nauseated or vomiting? Peppermint oil is ideal for an upset stomach. Fatigued, but stress keeping you awake? Lavender can help you relax. Dealing with diarrhea or constipation? Thyme or tea tree oils may help steady digestion. Anxious? Frankincense oil can dissipate nervous tension and help you regulate your breathing. A holistic therapist or naturopathic practitioner can help you select a set of oils (and provide dosing instructions) that are tailored to your individual condition. 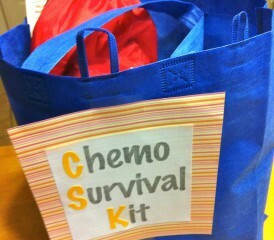 Okay, so you can’t pack a person in your chemo bag, but once you get to your appointment, you’ll be glad you invited an advocate along. These sessions can be scary, especially if it’s your first time, or if you’re not familiar with doctor lingo. Whether your companion is your spouse, child, friend, neighbor, or hospice nurse, their friendly face and reassuring support can make all the difference between a terrifying appointment and an empowering one.